Welcome to the House of Representatives of the Netherlands. The Dutch Parliament is called the States General. It consists of two chambers: the Senate and the House of Representatives. On this website we provide you with information about the House of Representatives. How does it work? Who are its members? How are they elected? The House of Representatives is to be relocated in 2020. 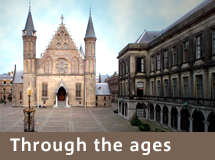 The historical Binnenhof building complex is in need of large-scale renovation, which will take five and a half years to complete. For the duration of that period, all current users of the Binnenhof complex will be moving to the former ministry of Foreign Affairs, Bezuidenhoutsweg 67, next to The Hague Central railway station. After the completion of the renovation the House will return to the Binnenhof. On Thursday, 14 February 2019, the Infrastructure and Water Management Committee met from15.00 to 18.00 to discuss the consequences of Brexit for the transport sector. The Minister of Infrastructure and Water Management, Cora van Nieuwenhuizen, attended on behalf of the government. Summer time or winter time? On Tuesday 4 December 2018 the standing committee on the Interior had a debate with Ms Kasja Ollongren, minister of the Interior, about a proposal from the European Commission to discontinue the seasonal changes of time. Almost a century ago, in 1919, Dutch parliament made a decision: henceforth, all Dutch men and women would be entitled to vote. A milestone that is worth celebrating. Find out how it all started and how the law on voting in the Netherlands is ever changing. Immediately after Prince's Day, the leaders of the parliamentary groups discuss the headlines of the Budget Memorandum and the national budget. This debate is called the "General Political Debate on the Budget Memorandum". It is normally held on the Wednesday and Thursday following Prince's Day, but this year, it will take place on Wednesday 19 and Friday 21 September. 18 September 2018, the third Tuesday in September, is "Prince's Day" (Prinsjesdag) in the Netherlands. On that day, King Willem-Alexander delivers the so-called "Speech from the Throne" (Troonrede), in his capacity as Head of State. He does so on behalf of the Government, in the Hall of Knights in the Binnenhof in The Hague. Subsequently, the Minister of Finance presents his "third-Tuesday-of-September"-briefcase to the President of the House of Representatives. This briefcase contains the Government's financial plans for the coming year. Prince's Day is an important day in Dutch politics, as it marks the start of the new parliamentary year.